"Colonist" redirects here. For other uses, see Colonist (disambiguation) and Settler (disambiguation). One can witness how settlers very often occupied land previously residents to long-established peoples, designated as indigenous (also called "natives", "Aborigines" or, in the Americas, "Indians"). In some cases (such as Australia), as colonialist mentalities and laws change, the legal ownership of some lands is contested by indigenous people, who either claim or seek restoration of traditional usage, land rights, native title and related forms of legal ownership or partial control. The word "settler" was not originally usually used in relation to a variety of peoples who became a part of settler societies, such as enslaved Africans (e.g. in the United States), indentured labourers (such as in Colonial America), or convicts (such as in British America, c. 1615–1775; Australia 1788-1868). In the figurative usage, a "person who goes first or does something first" also applies to the American English use of "pioneer" to refer to a settler—a person who has migrated to a less occupied area and established permanent residence there, often to colonize the area; as first recorded in English in 1605. In United States history it refers to those people who helped to settle new lands. In Canada, the Indian Act, passed in 1876, created a fundamental division between First Nations peoples and all others, who are termed Settlers. [by whom?] As the Indian Act is still in force, this distinction continues to present day with an existing Indigenous-Settler division, set in a settler-colonial context where it reproduces an inequitable racial structure. In this usage, pioneers are usually among the first to an area, whereas settlers can arrive after first settlement and join others in the process of human settlement. This correlates with the work of military pioneers who were tasked with construction of camps before the main body of troops would arrive at the designated campsite. Iraq – the Arabization program of the Ba'ath Party in the late 1970s in North Iraq, which aimed at settling Arab populations instead of Kurds following the Second Iraqi-Kurdish War. Israel – Israelis who moved to areas captured during the Six-Day War in 1967 are termed Israeli settlers. In recent years Israeli settlers have been settling in Palestinian territory such as the Gaza Strip and West Bank. However, this has caused political unrest and many settlers are forcibly removed from their settlements by the Israeli government. Women and children experience violence in these highly dangerous areas because of the conflict. Many natives face displacement when new settlements are established. During 1948 Palestine war, in which Israel was created, over 750,000 Palestinians were displaced from their homes and not allowed to return. Oftentimes fences or walls are built preventing the natives from traveling back onto the land. Settlements can make it very difficult for native people to continue their work. For example, if the settlers take part of the land which the olive trees grow on then the natives no longer have access to those olive trees and their livelihood is compromised. Many are met with violence when they try to get the things they need from the land. 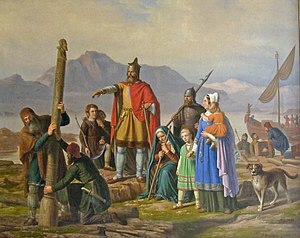 The reasons for the emigration of settlers vary, but often they include the following factors and incentives: the desire to start a new and better life in a foreign land, personal financial hardship, social, cultural, ethnic, or religious persecution (e.g., the Pilgrims and Mormons), political oppression, and government incentive policies aimed at encouraging foreign settlement. ^ Denis, Jeffery. S. (2015). "Contact theory in a small-town settler-colonial context: The reproduction of laissez-faire racism in Indigenous-white Canadian relations". American Sociological Review. 80 (1): 218–242. doi:10.1177/0003122414564998. ^ a b Olson, Pamela (2013). Fast Times in Palestine. Berkeley, California: Seal Press. p. 35. ISBN 978-1-580-05483-6.